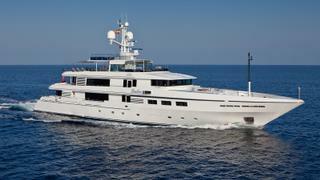 The 51 metre motor yacht Emelina, listed for sale by Burgess, has seen a price reduction of $2,000,000. Built in steel and aluminium by Italian yard Codecasa to a design by the yard's in-house team, Emelina was delivered in 2008. Lloyds classed and MCA compliant, she has a light and classic interior by Studio Dellarole sleeping up to 12 guests in five staterooms. The master suite is located on the main deck with a study area and a folding sea balcony. Two double staterooms are on the lower deck along with two twin cabins, one with an additional Pullman berth, and all have full en suite facilities. Unusually, a third double bed cabin on this yacht for sale is located within the master suite, with a door that opens out on to the study area. The aft deck is ideal for al fresco entertaining and dining with two large sitting areas around two coffee tables while in the saloon there is a central sofa, two low cocktail tables, six armchairs, a large television screen and a cabinet in the centre. The dining room has storage dressers to the side and a forward dining table with twelve chairs. More outdoor living is available up on the sun deck, with a built in seating area, a Jacuzzi tub and a wet bar with a sink, fridge and ice maker. Twin 2,447hp Caterpillar engines give her a cruising speed of 15 knots and a maximum speed of 18 knots. Lying in Palm Beach, Florida, Emelina is now asking $19,950,000.